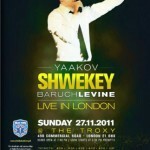 This past Monday night London hosted its second annual Hatsoloh concert featuring Yaakov Shweky and Baruch Levine. The concert was one of the best I’ve been to in a while, and was certainly worth the trip from Manchester. As I entered the hall I could tell it was going to be a good night. Most ofthe seats were full, and on the projected screen was the DVD form Caesarea II and got the audience (or at least myself), ready for the night ahead. Yaakov’s Chavrusah in Kollel Rabbi Shlomoh Farhi, now living in London working for Aish Hatorah, received a last minute call to host the show and then agreed to do so. Rabbi Farhi first introduced Baruch Levine and commented how caring Baruch is as a person, and pointed out that his initials even spell the word לב. Baruch Levine then burst onto the stage singing his hit song Chosson Hatorah and the crowd went wild, after the song he said how much of a pleasure it was to be in the UK for his first time and told the audience of his English connections, from his Grandparents before they moved to Canada, which (as Baruch joked about) was once owned by England. Baruch than sang one of the biggest hits in recent years, Vezakeini, and all the crowed joined in, and was moved by his rendition of the title track of his debut album, he dedicated the song to all the young children in the audience, Baruch then thanked the audience before leaving the stage, and Rabbi Farhi returned. Rabbi Farhi told the audience about some of his experiences with his friend, and how much of an inspiration he is, and then the headline act came out. Yaakov Shwekey was greeted by a huge round of applause, and everyone was excited. Yaakov entered singing Libi B’mizrach, the title trach of the hit sefardi album he brought out just over a year ago. After the song Shwekey told the crowd how happy he was to have been invited back to England again, he told us that English crowds are way better and livelier than New York crowds, (something which I certainly agree on) and then sang Im Eshkocheich. This song is one of his most famous songs, and comes from his Y’Did album, this was the 3rd time I have seen Yaakov live and this sing always creates high emotions running through me, the only negative was that I felt this song was done to early on. His next song was Areivim, from Ad Bli Dai which he dedicated this song to all of Am Yisrael especially his friend from Israel who was in the audience last night. Areivim is certainly one of my favorite songs from Ad Bli Dai and was wonderful hear it sung live. Next up was a medley, Yaakov said that a special audience like ours deserves a special medley and this one was made just for the occasion. The medley opened with Mama Rochel – this song became an instant hit when it was first released. The second song of the medley was Tatte, originally by Dveykus and then sung by Shwekey on his fourth album Leshem Shomayim with the original lyrics written by his rosh yeshiva. The final song of the medley was my sister’s favorite Shwekey song, Shema Yisrael. This medley had the crowed united and everyone joined arms together and swayed to the side. Then Yaakov bust into Kol Mevaser, one of my favorite songs at the moment, written by Yitzy Waldner and fist released on live in Caesarria II. This song had the crowed going wild – and deservedly so, it’s a very good fast song and with as Yaakov as a performer as well as a singer I’m not surprised at the crowd’s reaction. For the final song of the set, Baruch Levine joined Yaakov on stage and together they sang V’hoo Keili, a slow and great kumzits song and originally featured on Baruch’s debut album with guest vocals from Yaakov. The two performer left the stage together to applause from the crowd. As the performers relaxed and had a much needed break, a short video was shown and a speech from the president of Hatsoloh UK about the amazing work hatzoloh do, and pledged for donations for the needy cause. Next was a surprise, International superstar, originally from London but has been living in America for a few years was Chazzan Shimon Craimer. It was clear from the audience’s reaction how welcome he was back in his home town. Baruch Levine returned to the stage, with one of my favorites- Kol Haberuim, this got the audience alive again after the short break, and he then sang Piano Boy, from his English album, a song which tells the story about what we can all achieve. Yaakov Shwekey returned to the stage with Veshochanti from Ad Bli Dai, and he got the crowd were on their feet dancing, before singing Bo’ee B’shallom, a slow song but one of the best slow songs on libi B’Mizrach. Then came the song I’d been waiting for, again from Libi B’mizrach, Raoo Banim, a catchy song written by Yonatan Razel, and everyone enjoyed it. Baruch Levine then came to rejoin Shwekey on stage. Yaakov, told the audience that upon hearing the news of the passing of one of his best friends he called Baruch asking him to write a song about refuah. The song was first featured on Caesaria and then again on Boruch’s new album – Hashkifah, and the two of them singing together was a wonderful experience. Yaakov dedicated the song to all the kids from Camp Simcha who were in the audience. Then came the finale song, certainly one of the biggest wedding hits from the last few years, – Ma ma ma, another Yitzy Waldner composition. Baruch then returned to the stage, and the two singers wore hatzolah jackets and danced together, I didn’t realize that Baruch had some good moves. After the performers left the stage, it was time for the encore as no Shwekey concert is complete without Vehee She’omda, another Yonatan Razel song and another massive hit. This was certainly an amazing concert, and cannot wait for next time. My only wish was that Shwekey would have sung Hakadosh Boruch Hoo from Libi B’Mizrach, another of my favorites, but even without it the concert was still worth the long trip. I enjoyed this review immensely… especially the grammar and spelling. Shasha, you never cease to make me laugh, and i feel i can say with all certainty that you always will. While I was not at the concert, I did see some videos of the concert, and it was Rabbi Farhi (my old friend from camp) who sang and danced with Shwekey at the end by Ma Ma Ma, not Baruch Levine. really wonderful review, captured the excitement perfectly.